Note: The methodology differs from browser to browser. Hence, scroll down to find your browser and use the method which is specified for it. Since Google Chrome is the most used browsers in the world, let us start our list with the same. If there’s one thing Google Chrome is known for, it’s for its healthy selection of extensions. Extensions add a ton of functionality to Google Chrome, and we are going to use one today to solve our problem too. 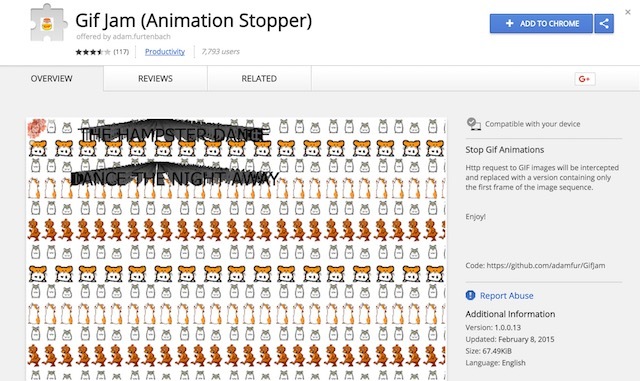 There are a couple of extensions which can help us solve the problem of autoplaying GIFs, but, probably the best one is GIF Jam (download). It’s pretty evident from the name itself, what the extension does. Basically, it will show you only the first frame of any GIF present on a webpage and stop it from loading. However, this also means that you will not be able to see any GIFs. To watch the GIFs, you will have to disable the extension and then reload the page again. If your problem is not with the autoplaying of GIFs but with their loading time, you should use another extension called GIF delayer (download). When the extension is running, it will only show the GIFs on a webpage when they have fully loaded. Thus, you won’t have to wait for the GIFs to load while looking at them when they are buffering. Just like on Chrome, you can also use an add-on with Firefox to stop the GIFs from autoplaying on any web page. To do that, download and install Toggle Animated GIFs (download). The best thing about using this add-on is that it allows you to use simple keyboard shortcuts to enable or disable the GIF animation. Hence, if you want to play the GIFs, you can easily do that by hitting the keyboard combo. You can hit Ctrl+M to enable/disable GIFs animation in the current tab or press Shift+M to restart all animations. 1. 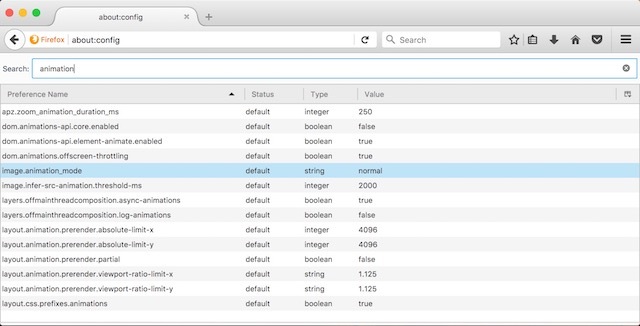 Open Firefox and type “about:config” in the address bar. Hit Enter and then click on “I accept the risk!”. 2. In the search bar, type “animation”. Select “image.animation_mode” and then double-click on it. 3. Type “none” inside the pop-up box and then click on “OK”. Follow the pictures for more clarity. 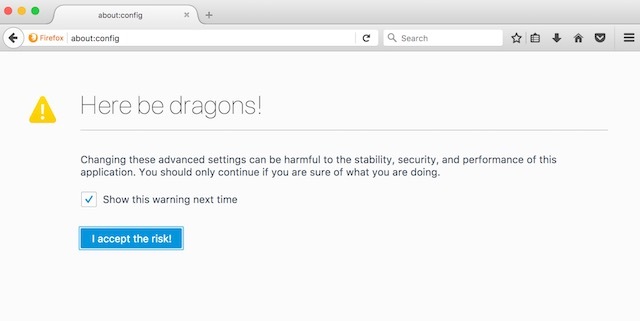 Once you hit okay, no GIFs will ever autoplay on your Firefox browser. If you want to go back to original settings just replace the text “none” with “normal” in the third step. Similar to Chrome and Firefox, there’s a pretty good add-on for Opera which is available in its extensions store and can stop GIFs from autoplaying. 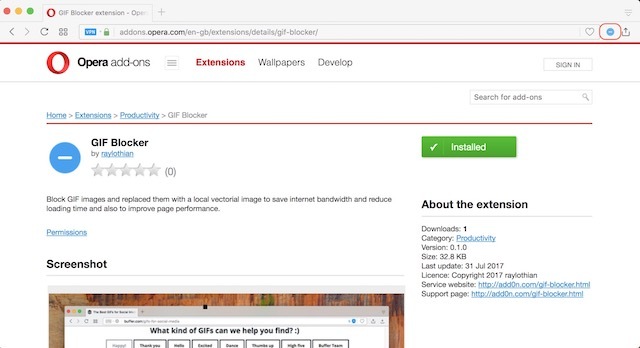 The extension is aptly called GIF-blocker (download) and you can install it by clicking on the mentioned link. Once installed, you can just click on the extension icon to enable or disable it. Once enabled, the GIFs on any web page will be replaced by the extension’s icon. If you want to see the GIFs, you will have to disable the extension by clicking on it and then refresh the page to load the GIFs. The macOS High Sierra update is bringing a lot of changes to Safari. One of the additions to Safari, is the feature which blocks videos from autoplaying on any website. However, the feature does not do anything when it comes to stopping GIFs from autoplaying on a web page. 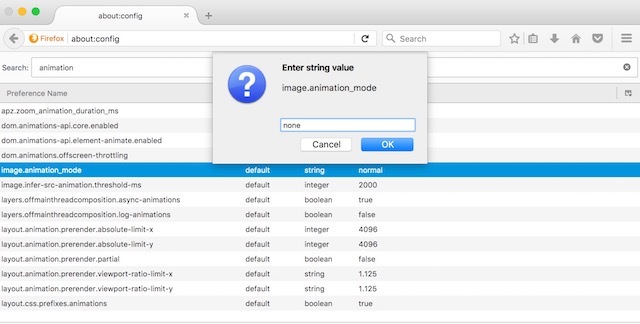 The only thing you can do currently to stop GIFs from autoplaying on Safari is to install the Deanimator extension (download). However, the extension has not been updated since last 6 years or so and does not seem to work on my device. It might work on the older versions of Safari, so if you are on the older version of macOS, you can check it out. Other than that, currently there’s no way to disable GIFs autoplay on Safari. As I mentioned in the introduction, GIFs are one of the best things that has happened to images in a while. But, because they are being overused in certain websites, it’s important to stop them from autoplaying. Stopping the autoplay of GIFs will result in faster page loading with lesser data consumption. Both of the outcomes are pretty useful if you are on a limited data service. Right now, there’s no apparent way to do this on the Safari as well as the Edge browser in Windows 10, but, we will update the article as soon as we find one. Meanwhile, do let us know if the autoplaying GIFs annoy you or not. Drop your thoughts about them in the comment section below.